Sorry for the late posting. Been very busy printing up Christmas Flight Manuals for this Friday and Saturday’s events. We’ll be meeting at the Elks this Friday (today actually), in the Dinning Room, they’re offering a special Christmas Dinner for $20. Hopefully, you should have received notice via Email about this early this week. Usual run time 7p-10p. But you may want to show up just a little early and kapu a space near the band. Christmas Flight Manuals will be provided, but bring yours just incase. Saturday we’ll be performing at the Fairfax Christmas Fair, 12p-2p, in the Pavilion (142 Bolinas Rd, Fairfax, CA 94930). I’ll be providing flight manuals also. We had enough interest, so we’ll be holding Saturday Kanikapila at the UFOHQ, 2p-4p, after the Fairfax event. Btw, please take note of Tucker’s Event below. HERE’S A PERFECT HOLIDAY GIFT FOR YOURSELF! OR THAT PASSIONATE FRIEND WHO WANTS TO EXPAND THEIR UKULELE EXPERTISE. 9:00 – STEVE QUAN -TIRED OF DOING THE SAME STRUM AT GROUP UKULELE SESSIONS? FROM THE PRESENTER OF LAST YEAR’S “FINGER-STYLE & STRUMMING TECHNIQUE TO WOW OTHERS!” WORKSHOP, STEVE QUAN WILL BREAK YOU OUT OF THE DOLDRUMS OF “SAME OLD, SAME OLD” WITH STRUMS YOU MAY NOT HAVE CONSIDERED TO IMPRESS OTHERS! HE WILL ALSO SHARE OTHER TRICKS WITH YOU TO ENLIGHTEN OTHERS OF YOUR ABILITY. 10:30 – RHAN WILSON – A LIFELONG MUSICIAN, PLAYS MULTIPLE INSTRUMENTS, AND WAS VOTED “BEST MUSIC INSTRUCTOR” IN THE SANTA CRUZ AREA IN 2016. HIS WORKSHOPS ARE INFUSED WITH ENCOURAGEMENT, INSPIRATION, AND PERMISSION TO THINK AND ACT LIKE A MUSICAL ARTIST. PLAYERS OF ALL LEVELS ARE SHOWN HOW TO PLAY TOGETHER, HOW TO LISTEN, AND HOW TO HEAR THE RHYTHM OF THE MUSIC. 10:30 – AMY FRIEDRICKS – MULTI-INSTRUMENTALIST AND EDUCATOR. SHE TEACHES PRIVATELY IN MARIN AND AT VARIOUS ADULT MUSIC CAMPS. SHE IS CO-FOUNDER OF THE MARIN UKE CLUB. HER WORKSHOP, ROCK THAT STRUM, WILL GET YOU OUT OF YOUR STRUM RUT AND EXPLORING SOME ROCKIN’ TOE TAPPING NEW GROOVES. LEARN HOW TO PLAY THE RIGHT STRUM(S) FOR ANY SONG. WE’LL ROCK OUT PLAYING BEATLES AND OTHER CLASSICS. DO YOU HAVE A TUNE IN YOUR HEAD? A LYRIC IN YOUR HEART? NOW’S THE TIME TO GO FOR IT! 10:30 – TUCKER SPOLTER – TUCK’S TAUGHT PRIVATELY TO ALL AGES. TEACHES IN MILL VALLEY, SAN RAFAEL AND IS THE LEADER OF UKULELE JUBILEE. HE PROMISES TO PULL ALL THAT YOU’VE LEARNED THE PAST THREE WEEKS AND APPLY IT TO YOUR FIRST COMPOSITION. WE’LL EXPERIMENT WITH CHORD MAPS AND UNUSAL CHORD PROGRESSION YOU’LL BE AMAZED AT YOUR OWN CREATION. YES, YOU CAN WRITE A SONG. Class size will be limited! Bring ukuleles, (IN TUNE)music stands a binder and pen or pencil. WE PROMISE SOMETHING FOR EVERYONE. Here are three simple ways to register for our Ukulele Workshop. Please remember we were SOLD OUT out last year! Special attendance fees for those who can’t attend the entire 3 days. Camino Alto, Mill Valley 94941 PLEASE MENTION UKULELE WORKSHOP AND INCLUDE THE BAR CODES FOR THE SESSIONS YOU WANT TO ATTEND. Ok, I’m bushed, time to catch a few zzzzzzz’s. See you in a few hours . . . .
We’ll meet at Campbell hall 6:30p – 9:00ish this Friday. BYPotLuck, BYOGear and BYAlohas, of course. Mahalo to Reverend Chip for hosting us once again at their beautiful Hall. Saturday, we’ll be meeting at the UFOHQ at our usual run time of 2-4pm, BYOSnacks and Beverage and BYOurSelf. Big Mahalo Nui to the Ohana Members that helped with the MNF Dinner at the Elks this past week. Click below for images . . .
Click here for Friday Night photos and here for Saturday Day photos. 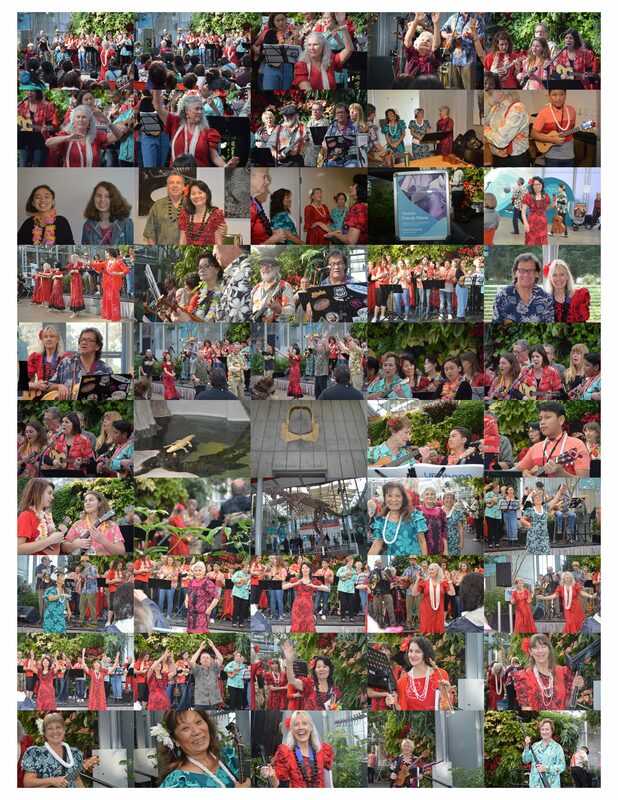 Below is the Halau performing in Kailua, Hi. Also, we’ve been invited to perform at the Fairfax Christmas Fair again this year at the Pavillion. December 10th, 12p – 1p. Come if you can . . . if no can . . . no can. Ok, it’s getting late, I’ll see you folks this weekend!